Note – This is my last contribution to this blog, which is winding down and will come to an end next week with a final post. 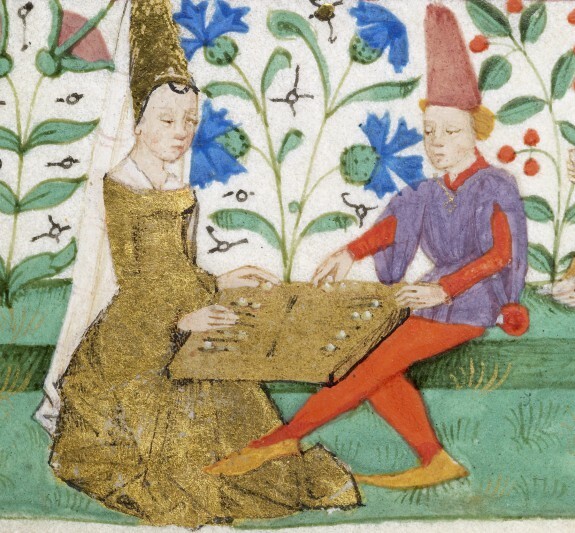 The present post is also a new beginning in that it is the gateway, as it were, to my new blog, medieval books.nl, which is live as of today (22 August, 2014). Hope to see you all there! 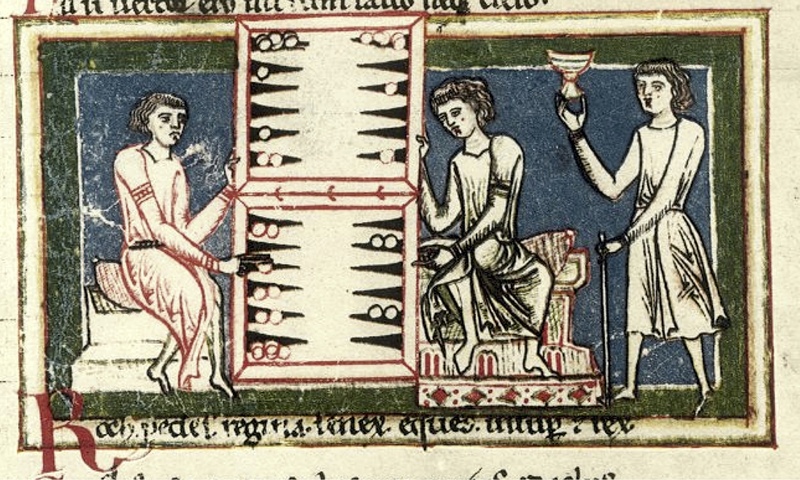 Note that the first entry of my new blog features a companion post on “The First Page of the Medieval Book” (read it here). The medieval lapidary is essentially a book about stones, both precious and semi-precious gems and minerals as well as mythical stones that may never have existed. Closely linked to the bestiary, which has been discussed in previous project blog posts, the medieval lapidary tradition can be traced back to antiquity with the text on Natural History by Roman historian Pliny the Elder (ca. 23-79 CE). Pliny’s account of the properties of various stones and gems, which he categorized by color, durability, and origin, became the basis for knowledge about rocks and minerals throughout the Middle Ages. As legends grew regarding the hidden, magical properties of various gemstones, Christian writers added an allegorical, divine meaning to this system of classification. As such, the pearl is often a seen as a representation of Mary. Perhaps the most widely distributed medieval lapidary was composed in c.1090 by Marbod of Rennes. 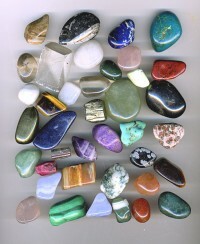 His Book of Stones, or Liber lapidum, describes in verse the various qualities of sixty gems and minerals. Marbod listed the medicinal qualities of many stones including diamond, topaz, sapphire or lapis lazuli, and coral. According to Marbod, emerald or smargardus increases wealth, coral protects against lightning or tempests, while diamonds can drive away nightmares and cure insanity. 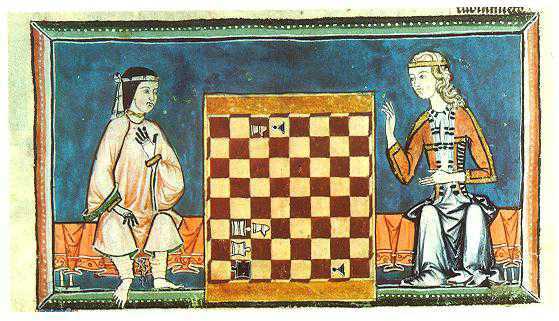 Another well-known patron of the medieval lapidary tradition was Alfonso X the Wise, King of Castille and Leon (c.1250 – 1284). He influenced the organization of stones according to the signs of the zodiac. Other works can also be considered lapidaries, though not in the strict sense. For example, Isidore of Seville’s Etymologies discusses the qualities and potential applications of stones such as jasper, while Hildegard of Bingen writes about the medicinal usefulness of stones as healing charms in her work, Physica. 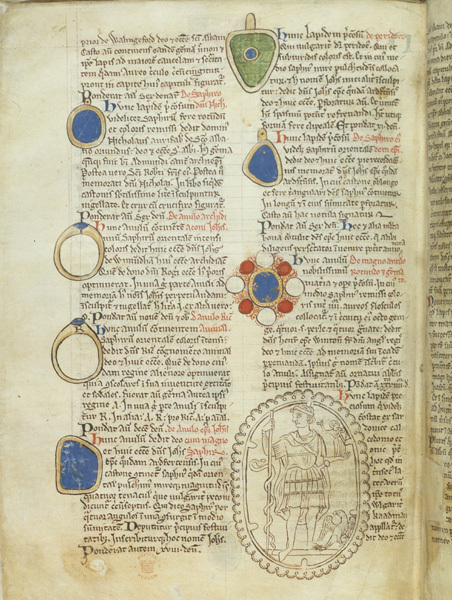 The thirteenth-century work by Matthew Paris gives an account of the gemstones held in the abbey of St. Albans. 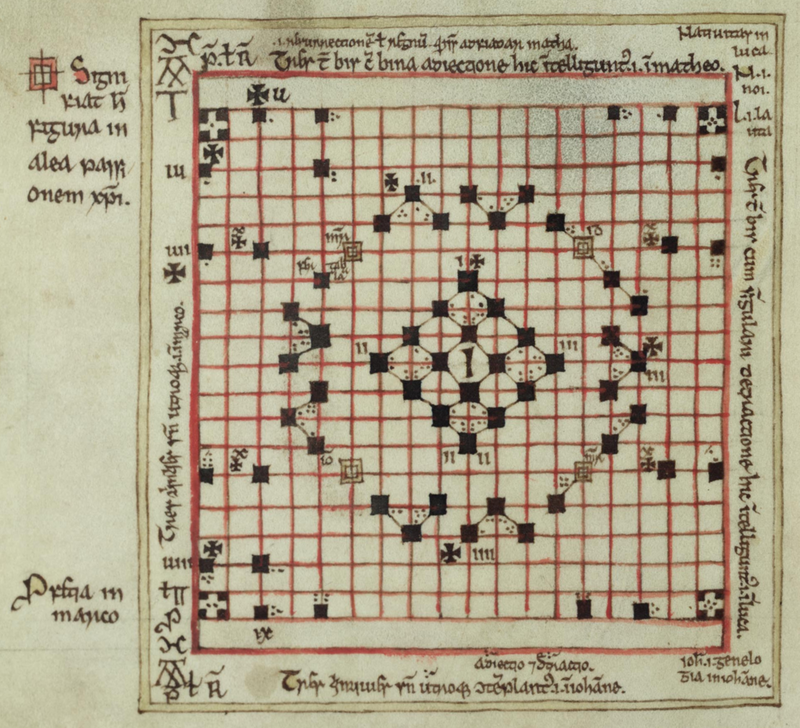 His Liber Additamentorum provides images of the gems in addition to recording their qualities. 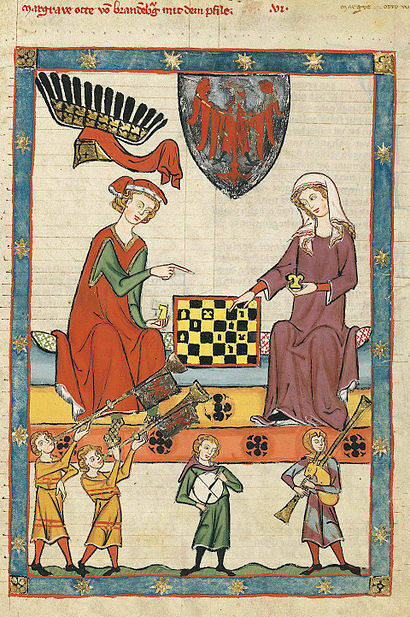 The production and use of the medieval lapidary was important to the understanding of the symbolic as well as the natural properties of gems and stones and thus influenced a variety of medieval artistic endeavours. 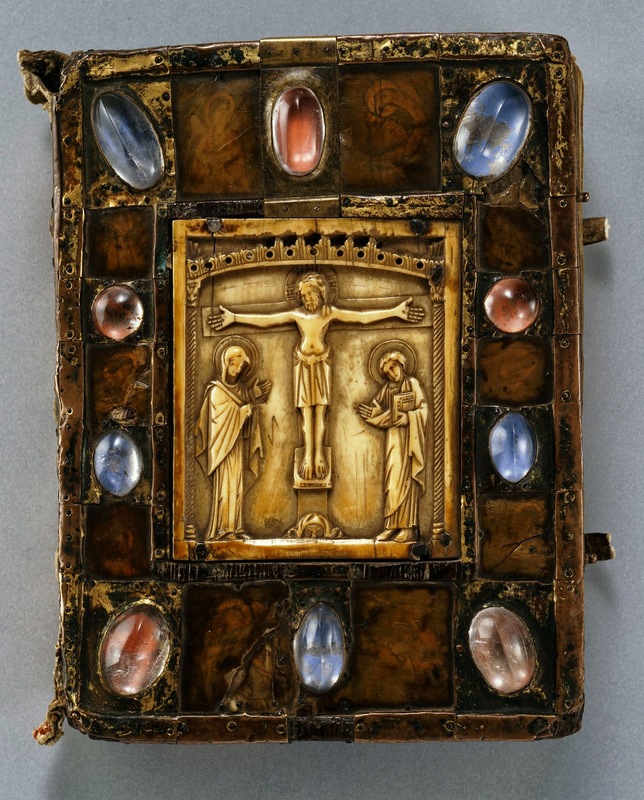 The decoration of prized objects such as Bibles or Gospels with precious gems and stones, as discussed in a previous blog post, represented not only the wealth and piety of the patron, but carried with it many levels of meaning. Gospel Book (so-called Small Bernward Gospel) Front cover: German (Hildesheim), second half of 12th century. Gilded copper, rock crystal, paint on parchment under horn on oak; Byzantine ivory plaque. Dom-Museum Hildesheim (DS 13) Photograph by Erika Dufour, courtesy of the Art Institute of Chicago. There are many other lapidaries that support the medieval interest in the symbolism of gems, rocks and minerals, such as the eleventh century Damigeron lapidary, the Nautical lapidary, the German vernacular Das Steinbuch which lists thirty-eight stones, and The Book of Minerals by Albertus Magnus. Large collections of rocks, gems and minerals along with an interest in their natural and hidden properties can be traced to Greek and Roman origins. The medieval lapidary book tradition was a continuation of this interest and a popular resource for making sense of the natural and mystical properties of stones. 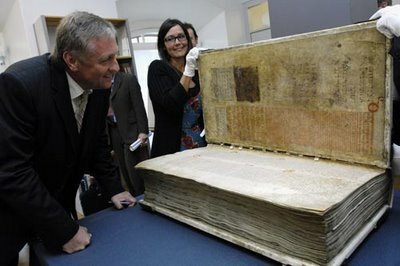 Medieval books were often expensive to produce, and usually the property of institutions. But some manuscripts were copied specifically for individuals, and designed to be carried on the person. Portable manuscripts come in many different forms and each is a witness to a different context of use – a valuable insight into medieval culture. 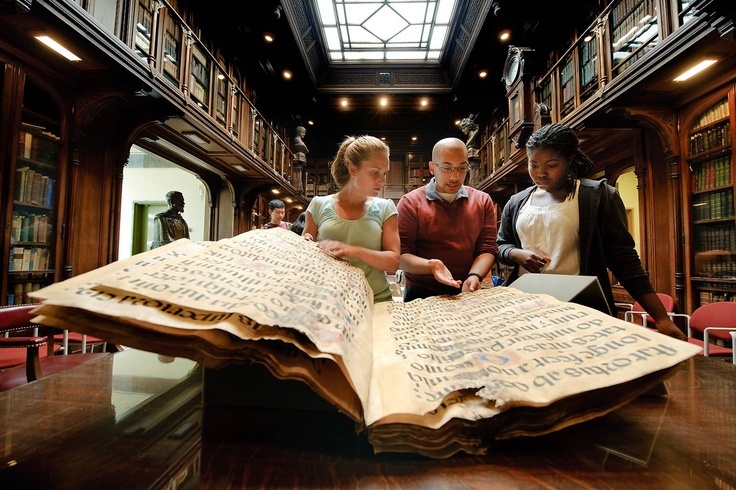 Size is a major factor influencing the portability of an object, indeed, it can be a defining characteristic in evaluating the potential use-context of a manuscript, as discussed here in another blog entry. But size does not always tell the full story. 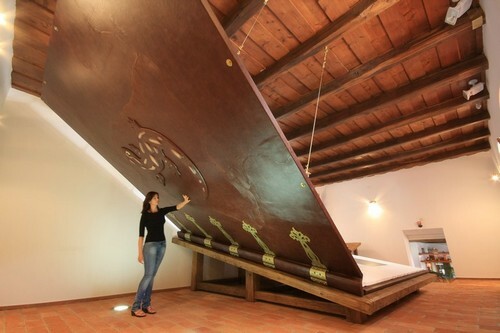 Take, for example, the production of one-volume Bibles in the thirteenth century. These Bibles (often termed ‘Paris Bibles’, as Paris was the major, though not only, centre of their production) represented a dramatic departure from previous practices. Bibles were traditionally large, often copied in separate volumes, but Paris Bibles were small and designed to accommodate all the books of the Bible. By the mid-thirteenth century, one-volume Bibles could be as small as 200mm high, and came to be known as ‘pocket Bibles’. 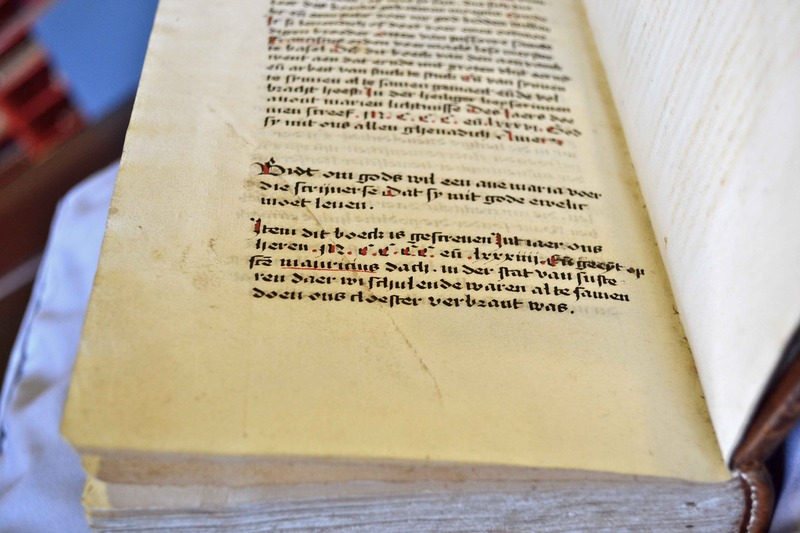 The popularity of these Bibles seems to have been fostered in part by the success of the new preaching orders, particularly the Fransciscans and Dominicans, founded in the early thirteenth century. 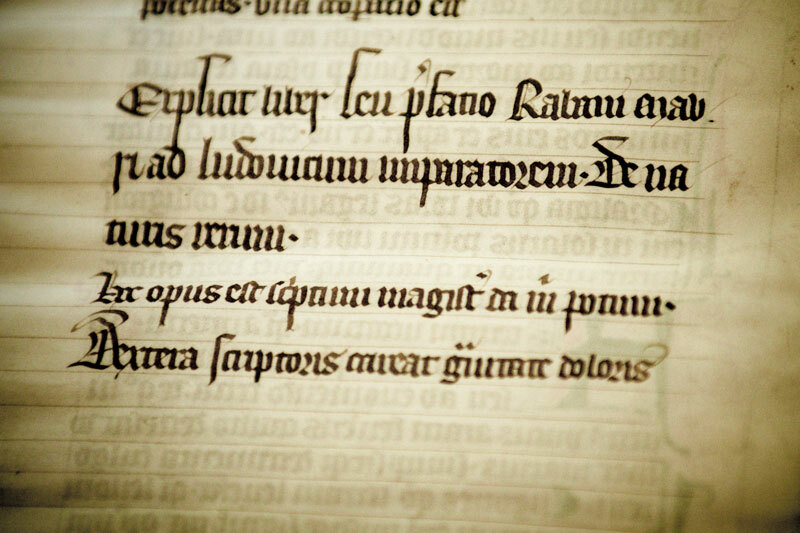 The Friars travelled, and in their fight against heresy were in need of a standardised text of scripture, of the type found in the Paris Bible. 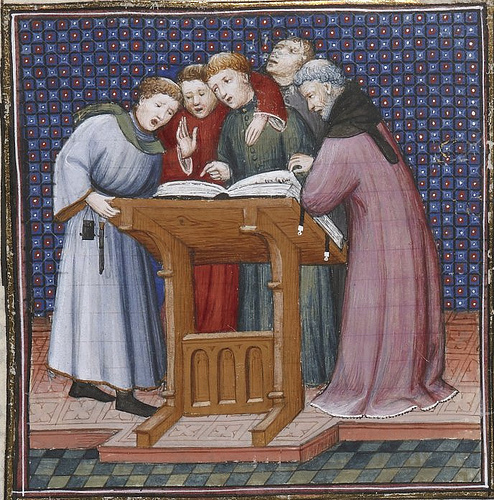 As preaching was their main mission, each Friar needed his own Bible (which conventionally was property of the order, rather than of the individual). 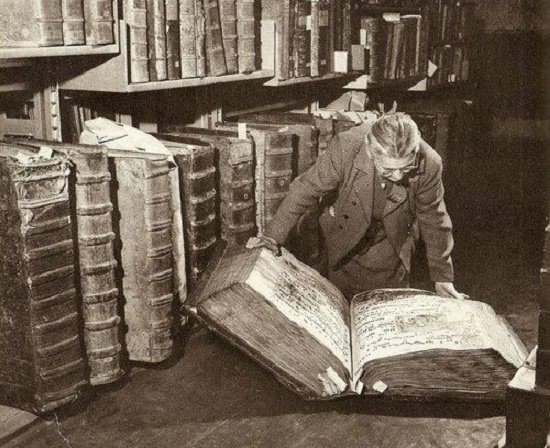 Not all medieval portable manuscripts were designed to be carried in one’s pocket. 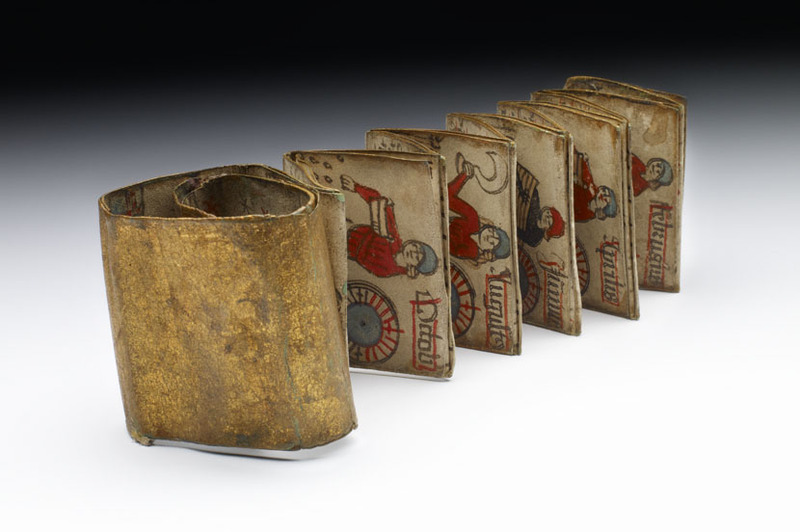 ‘Girdle books’ could be carried on a belt, and seem to have been designed for ‘on-the-move’ reading. 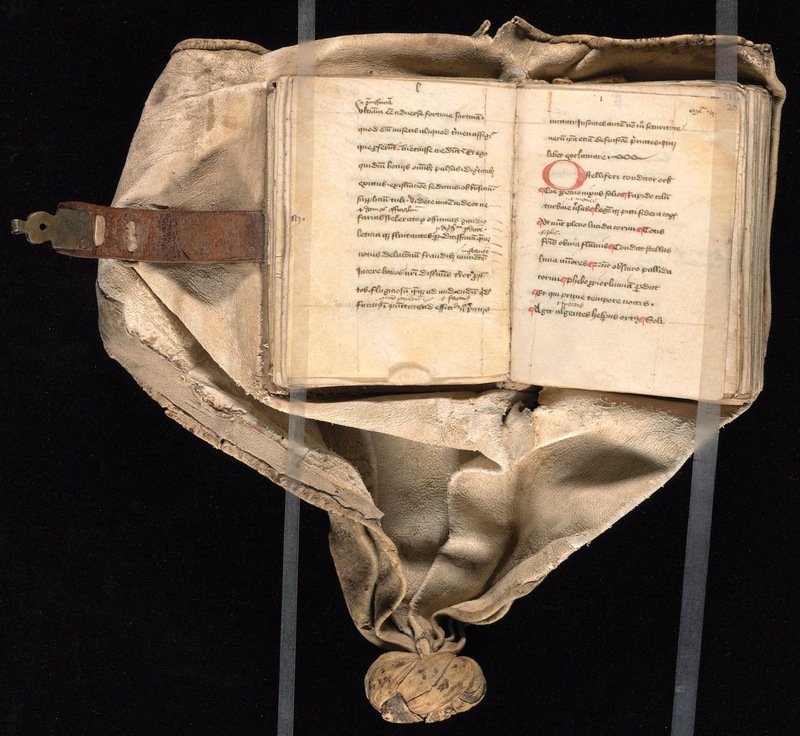 The Yale ‘Girdle Book’ (Beinecke, MS 84), a copy of Boethius’ De consolatione philosophiae measuring only 100x80mm, was designed to be worn in this fashion and would have hung upside-down off a knot on the users belt, so that the text would be the right way up when lifted from the belt to be read. 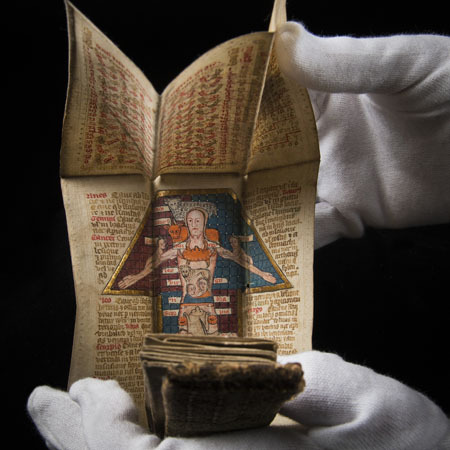 Certain genres of manuscripts were frequently copied to be worn like this – for example, medical almanacs were often designed as folding manuals to be worn on the belt, allowing easy consultation by travelling doctors. Wellcome Library, London, WI no. C0096769. A particularly deluxe fifteenth century folding almanac, opened here to show the Zodiac Man, a table to show the times of the year when bloodletting was advised and prohibited. 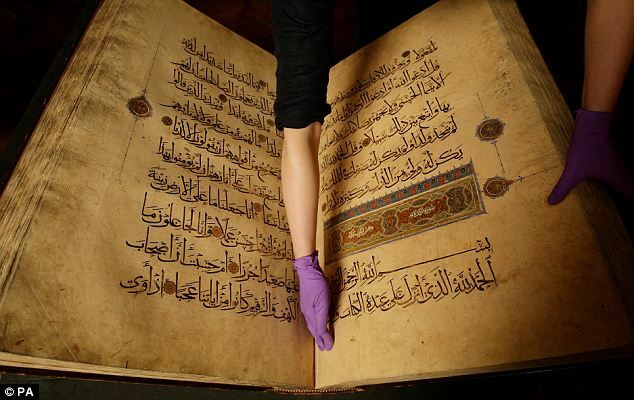 Some manuscripts were carried on the person because their proximity was considered talismanic. This is probably the case with British Library MS Stowe 956, a tiny copy of the psalms (40x30mm) bound to be worn on a belt. Its tiny size suggests it was intended to be worn as a devotional object, rather than to be read. 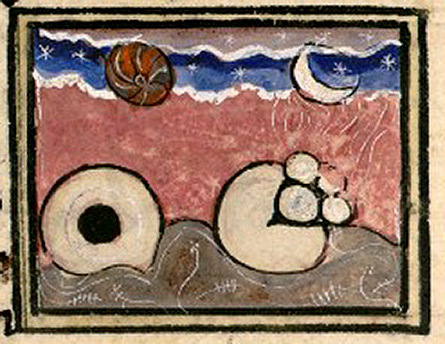 British Library, MS Stowe 956, f. 1v-2r. 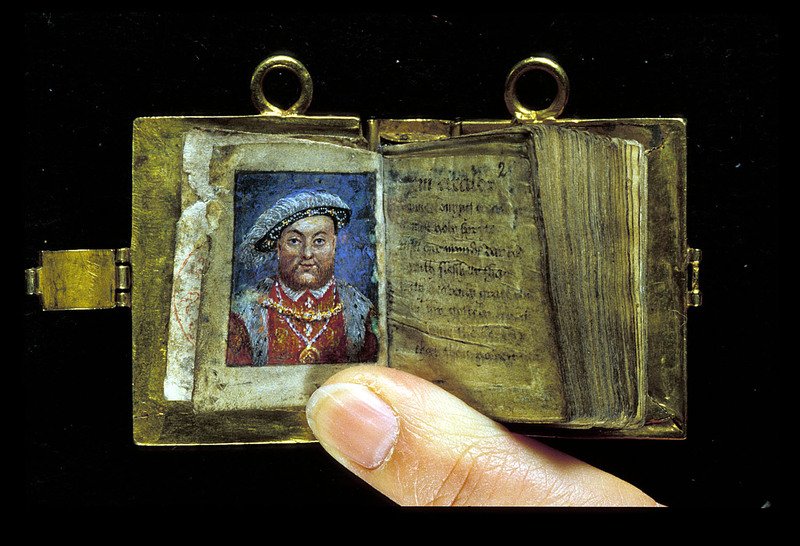 Copy of the psalms preceded by a miniature of Henry VIII. This originally belonged to Anne Boleyn. 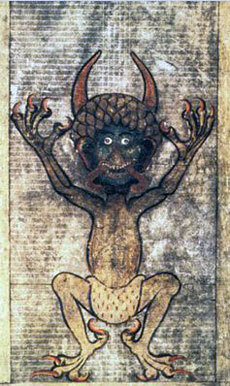 Another example of this kind are medieval prayer rolls. The Arma Christi, a religious poem in Middle English dating from the late thirteenth century, was frequently copied on to a small parchment roll to be carried on the person. Accompanied by images of the Passion of Christ (including ‘life-size’ renditions of the nails of the cross) these rolls were intended for contemplation and meditation. Only 63mm wide, this fifteenth-century example would have been easily held in a hand by a medieval reader. Huntington Library, HM 26054 – a section of an illustrated Arma Christi roll. One of my favourite ‘portable manuscripts’ is this illustrated almanac for peasants, dating from 1513. Each month is accompanied by a picture of a farmer doing the work best suited to that time of the year. The roll also contained an image of Christ crucified, again demonstrating the strong relationship drawn in medieval society between work and prayer. For me, this manuscript, despite its diminutive size and format, literally ‘speaks volumes’ about the Middle Ages. 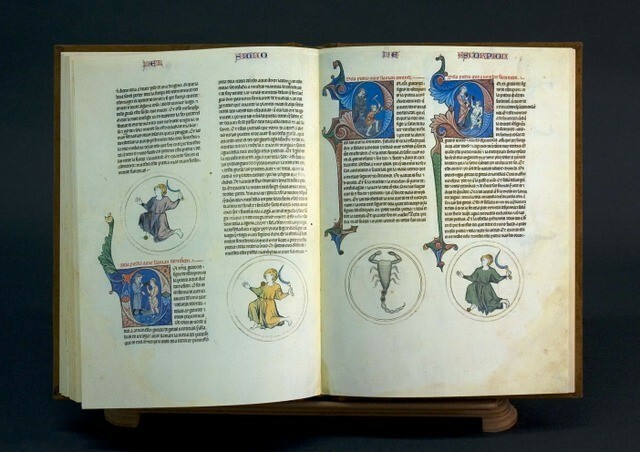 When talking about manuscripts with the uninitiated, I usually mention how features that guide us through our modern books – running titles, subheadings, and indices, for example – originated in the Middle Ages. Yet, I tend to overlook bookmarks (despite my childhood collection of them) as a sort of ‘separate apparatus’. Bookmarks, however, also have an interesting medieval past! 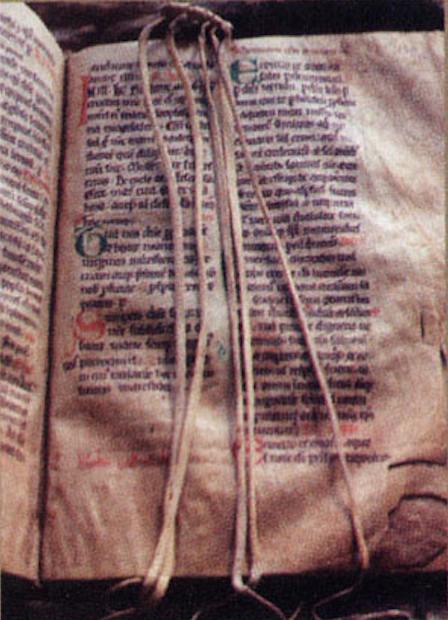 Unlike today’s kitten-adorned cardboard versions, or the crocheted worm variety (my personal favourite), medieval bookmarks tended to be less decorative, but über practical. There are essentially three types of bookmark, most of them extant from the twelfth century onwards* and usually found in liturgical books (as the Mass celebrant had to locate various readings in several different books depending on the day). This type is arguably the ancestor of today’s binder or index tab. A tab made out of a bit of parchment (sometimes cut from the edge of the page itself), coloured leather, or even a sort of woven bead, was stitched onto or looped through a cut in the page at the height of the desired text. These may have also been used to mark the beginning of different texts in a composite manuscript, or different chapters. 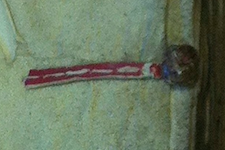 Knotted tab in the left margin, likely marking a new text in a formerly composite manuscript. 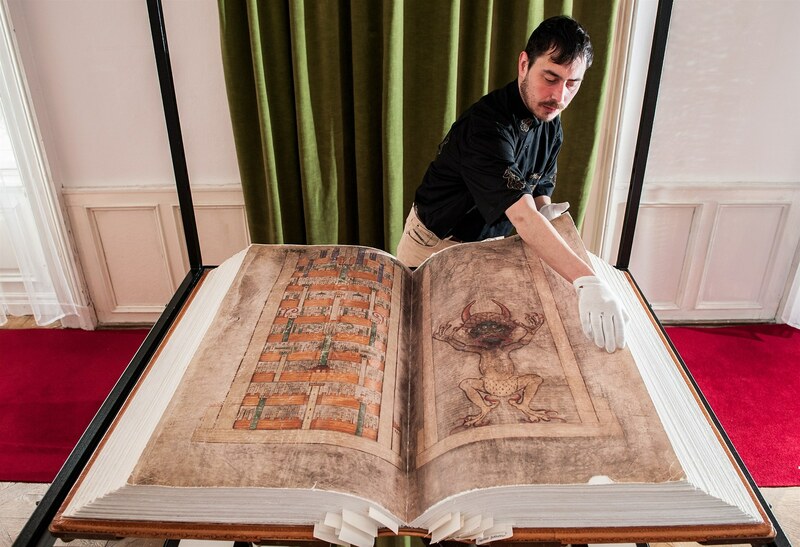 Bruges City Library, MS 47, 1v-2r, 3rd quarter 12th c. Photo Jenneka Janzen. Close-up of knotted tab, Bruges City Library, MS 105 front flyleaf, c. 1175-1200. Photo Jenneka Janzen. Tab made from the page itself (recto and verso of same folio). Oxford, Balliol College, MS 86, 14th c. Photo Balliol Archives conservationist blog. Probably closest to modern bookmarks, the register bookmark comes in three smart versions. The simplest is similar to what you’d find in a nice edition today – a long strip of parchment, leather, string, or ribbon attached to the endband or spine of the book that could be draped between pages. There might be several ribbons, for the reader to mark several pages. 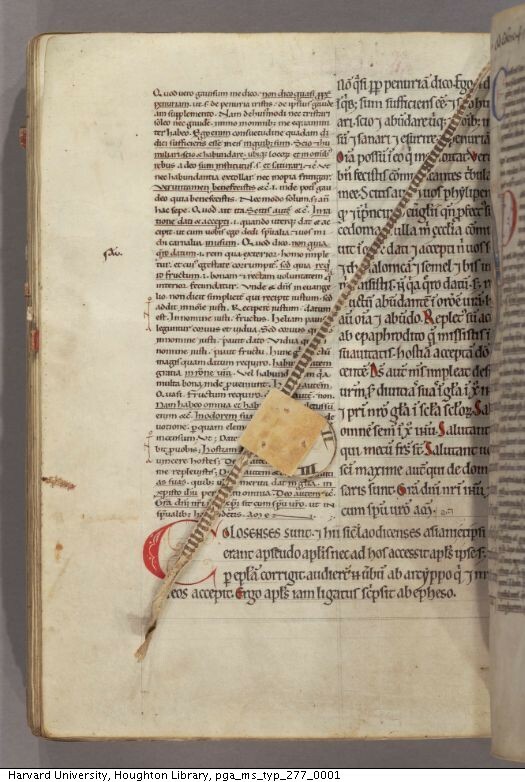 Manuscript endband with register bookmark and foot with trailing cords. 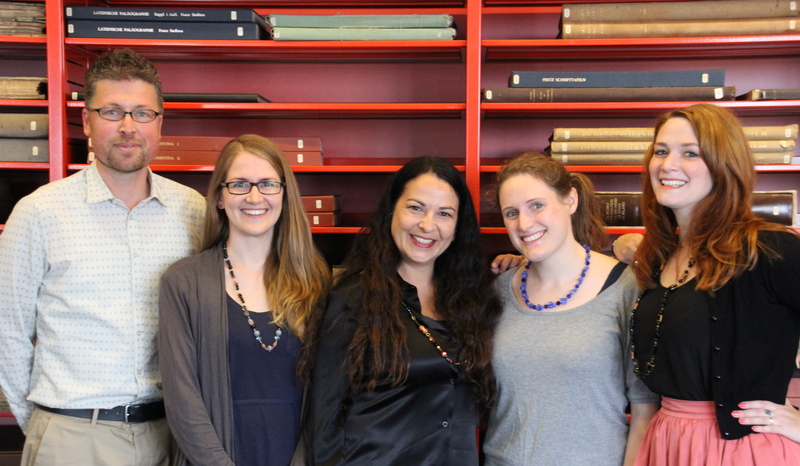 Auckland Libraries, Sir George Grey Special Collections, Med. 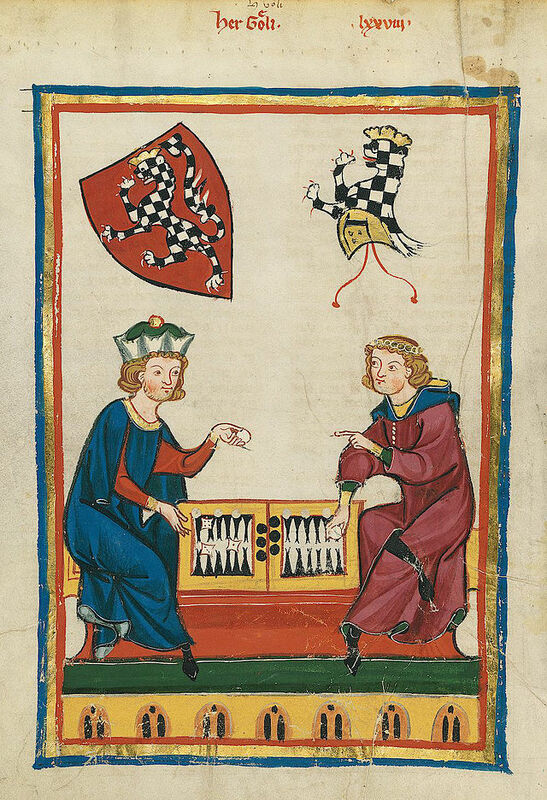 MS S.1588. 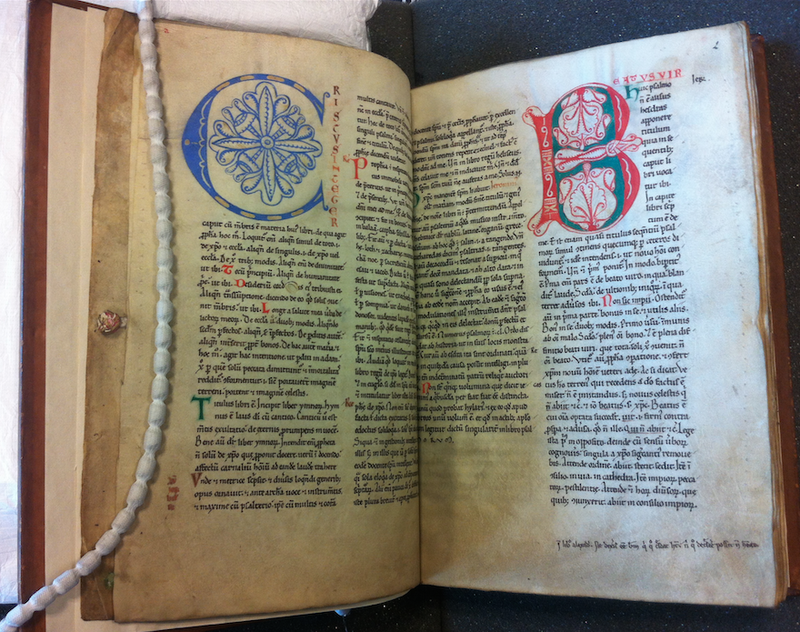 Photo Alexandra Gillespie, from her blog Medieval Bookbindings. Another variation on this theme was the portable register, made by attaching a number of strings or strips to an anchor (a peg or square of parchment or leather), which rests at the top edge of the book. Removable register bookmark in Exeter Cathedral, MS 3515, 13th c.
The third version of the register bookmark is the most ingenious! A little rotating dial made of parchment is added to the bookmark string, usually with numbers one through four marked on it signifying the standard four columns of text at each opening (i.e. column A and B verso, and column A and B recto). When the reader wanted to mark his spot, he slid the dial up or down the string to line up with the spot he wanted to mark, and then indicated, using the wheel’s markings, the desired column. Register bookmark with adjustable dial set between column II and III (i.e. col. B verso and col. A recto[not pictured]). 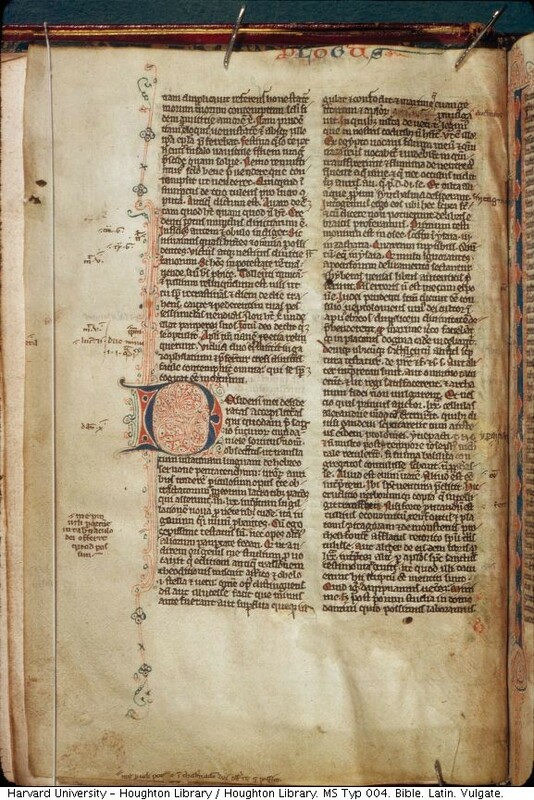 Harvard University, Houghton MS Typ 277, 12th c.
The last type of bookmark is the most obvious: the found object, or essentially whatever-happens-to-be-at-hand bookmark. Much in the way we might re-purpose an old shopping list or photo, medieval readers used parchment scraps, bits of string, or pieces of plants to mark their spot. 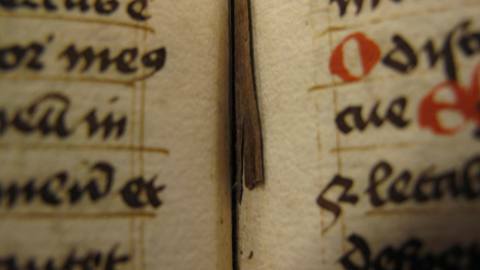 Turning Over a New Leaf project leader Erik Kwakkel found a lovely leaf bookmark in an incunabula in Zutphen. 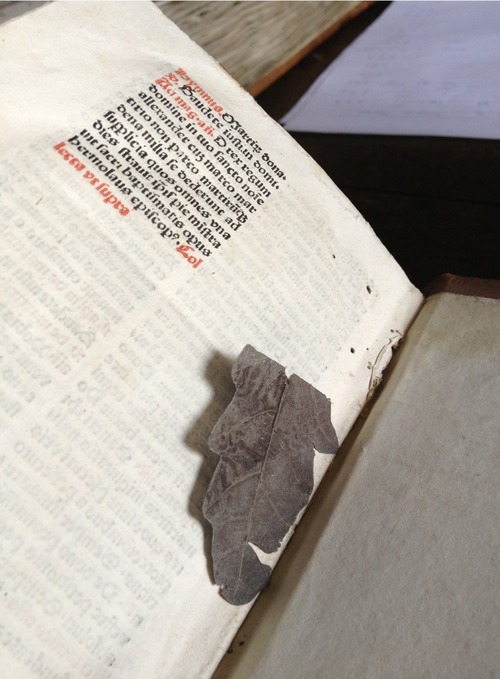 Leaf bookmark found by Erik Kwakkel in an incunabula in Zutphen’s chained library. Photo Erik Kwakkel. See more on his Tumblr. 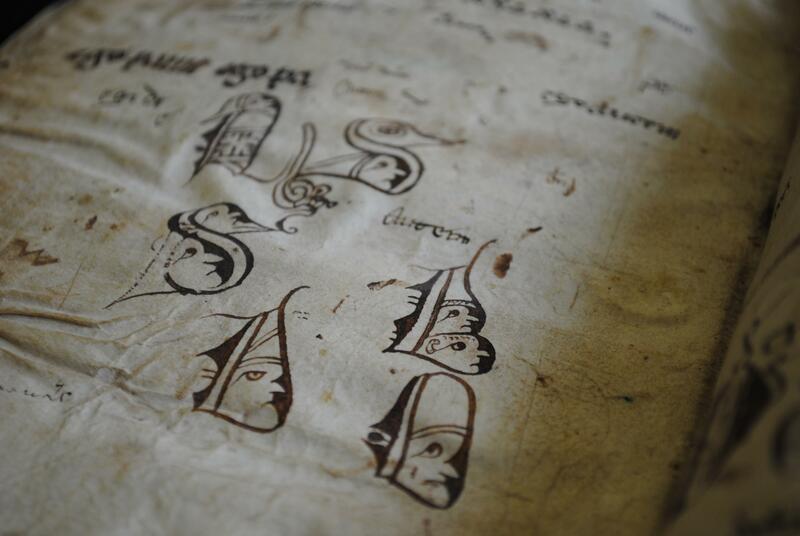 Auckland Libraries, MS G. 185, Photo Alexandra Gillespie, from her blog Medieval Bookbindings. 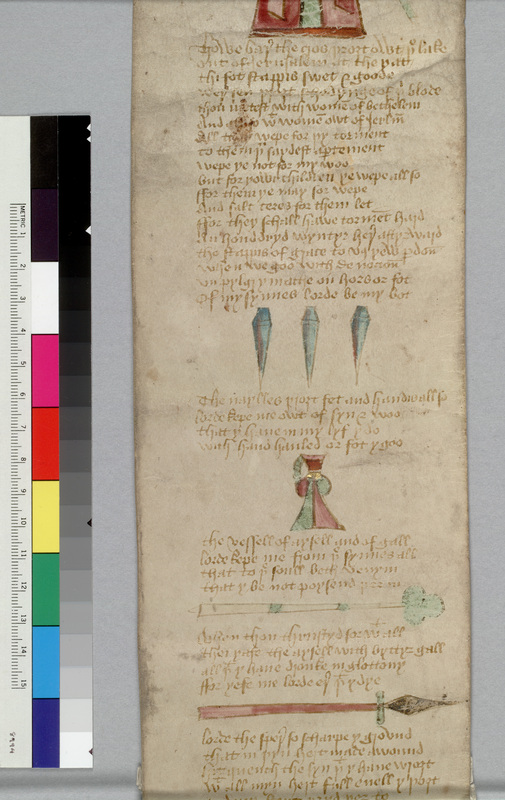 Despite their attraction, medieval bookmarks are often left unmentioned in special collections catalogues, making them interesting little surprises for manuscript scholars. Want more on bookmarks? Stay tuned to upcoming Turning Over a New Leaf blog entries! 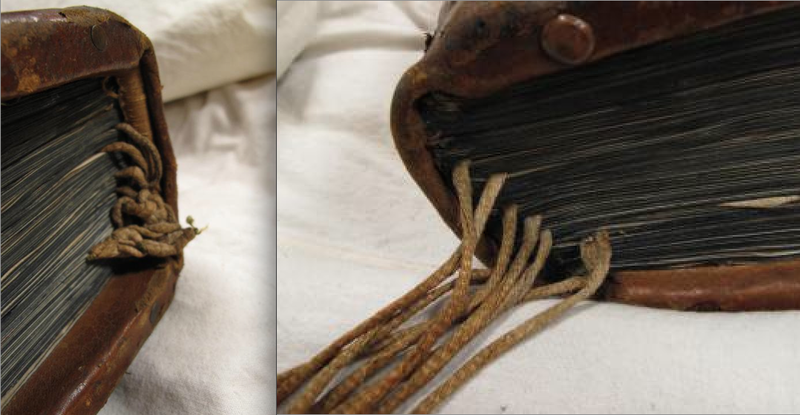 *According to Szirmai (1999) there is a cord bookmark attached to the endband of St Gallen, Stiftsbibliothek, Cod. Sang. 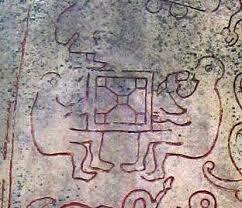 95, although it isn’t visible in the e-codices images.